Bureaucratic burdens on the farming industry will be put under the microscope by a new Task Force announced by Agriculture Minister Jim Paice today. 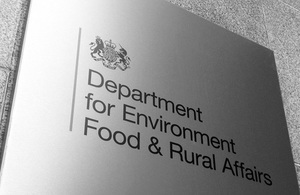 The Task Force on Farming Regulation, to be chaired by Richard Macdonald, will identify ways to reduce the regulatory burden through a review of the relevant regulations and their implementation, as well as advise on how best to achieve a risk-based system of regulation in the future. “There’s too much red tape tying up our farmers and preventing them from getting on with the business of producing our food and managing our countryside. That’s why we committed in the Coalition Agreement to reduce the regulatory burden on farmers by moving to a risk-based system of regulation. The burden on farming and food manufacturing businesses is not just the number of regulations but the emphasis on process rather than outcomes. “I’m going to ask this industry-led Task Force to look at the way we make and implement regulations right across the board, both at what’s already in place, and how we should do things in the future. “I am very much looking forward to leading a task which I have long thought needs doing. It won’t be easy to achieve significant results overnight, and as well as the Task Force itself I plan to consult everybody in the farming and food sector interested in working with us. Together I hope that we can make a real difference”. The Task Force will make its initial recommendations to Government by early 2011. The full membership of the Task Force will be announced in the near future, along with its Terms of Reference and details of how the wider farming and food sector can engage with the work of the Task Force. Richard Macdonald was appointed as the NFU’s Director General in July 1996 and held that post until December 2009. He had overall responsibility for the management of the NFU and for policy advice to the organisation, as well as critical roles in the BSE and Foot and Mouth disease crises. Other posts held include membership of the Government’s Sustainable Farming and Food Strategy Implementation Group and membership of the steering group for an English Collaborative Group as recommended by the Food and Farming Commission. He is currently a trustee of Farm Africa and a governor of the Royal Agricultural College, Cirencester. Since retiring from the NFU in February 2010, Richard has taken on a non executive director role with poultry producer Moy Park. In June 2002 Richard was awarded the CBE for Services to Agriculture in the Queen’s Birthday Honours. Richard lives in Oxfordshire and is married with two daughters. His interests include cricket and golf and gardening.